Over two weekends earlier this year, the U.S. Coast Guard Auxiliary University Programs Unit at The Citadel took responsibility to plan and host the Auxiliary Leadership and Management School, AUXLAMS, on their campus in Charleston, S.C. Over twenty-four Auxiliarists participated in the two-session course on leadership, ethics, problem solving, and team building. AUXLAMS specializes in laying the foundation for strong leadership skills via an experience-driven curriculum. Pictured right: A happy Citadel team poses for a photo between exercises. As an Auxiliary C-School, instructors teach most AUXLAMS courses at Coast Guard installations throughout the country. However, the students at The Citadel, bound by the busy schedules of full-time university students, took it upon themselves to bring this invaluable training to their own backyard over the weekends of February 8th-10th and March 1st-3rd. Through careful planning and strong motivation, they secured classroom space and instructors and drew in many Auxiliarists from other Flotillas. Pictured left: Ms. Margaret LaRiviere ’15 uses a Tinkertoy construction set in an exercise during AUXLAMS A. The students at AUP Unit Citadel were eager to apply their unique curriculum of a senior military college to the diverse missions faced by the U.S. Coast Guard and U.S. Coast Guard Auxiliary. In the AUXLAMS sessions, students used idea boards, Tinkertoy construction sets, role playing, film clips, and communication exercises to highlight important skills such as team leadership and ethics. Ms. Alexandra LaRiviere ‘14 appreciated how the course “put into perspective every level of leadership and tied together previous knowledge” gained at The Citadel. Five Citadel students successfully graduated AUXLAMS, a testament to the fundamental values instilled by AUP Core Philosophy. The course fulfills the Maritime Leadership Capstone (MLC) required for AUP graduation and prepares students for first-line leadership positions in any context. By taking classes to build capacity and prepare for the future, AUP students are becoming the next generation of capable Coast Guard mariners. Pictured right: Completed idea boards line the classroom wall. Elsewhere around the country, other AUP students are planning to take AUXLAMS courses on their own. Unit W&M students took AUXLAMS A this past weekend in Baltimore and will take AUXLAMS B at Training Center Yorktown in April. AUXLAMS embodies the premier formalized training available to Auxiliarists throughout the nation. Through a process of hands-on simulations and inquisitive ethical dilemmas and conflicts, students earn three upper-level college credits through the American Council on Education and receive the experience necessary to be Semper Paratus. 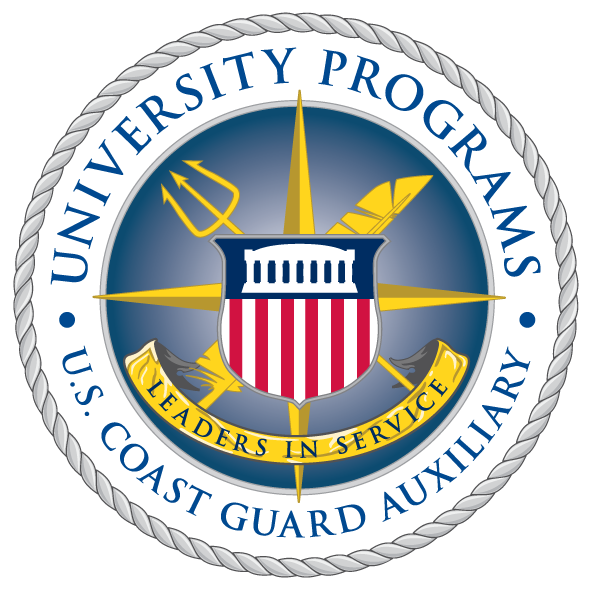 An AUXLAMS leadership credit also counts towards the prestigious AUXOP qualification, known as the “Ph.D of the Auxiliary.” Wherever AUP students go after graduation, they will carry with them the leadership experience and critical thinking gained at AUXLAMS to implement in any situation. Pictured below: Citadel students show off their course completion certificates at the end of AUXLAMS courses held on-campus.